Scientists from Woods Hole Oceanographic Institution and Scripps Institution of Oceanography are teaming up on the Hawaiian Research Vessel Kilo Moana to study the Samoan Hotspot. They named their expedition ALIA after the ancient twin-hulled canoe that Samoan Warriors used to explore the SW Pacific. The Kilo Moana will leave Pago Pago on April 4 with a crew of science warriors with an ambitious plan to study active and extinct underwater volcanoes along the chain of Samoan of islands. The ALIA expedition will study previously uncharted seamounts and the submarine portions of some islands, scattered over almost 600 nautical miles, from its most recent and quite active Vailulu’u submarine volcano in the east to Combe Island in the west. The data and rocks collected during the ALIA expedition will be used to explore the hotspot model, which predicts that ocean island and seamount chains are formed on moving lithospheric plates by stationary hotspots in the Earth’s mantle. The last target for the ALIA cruise was set today and we are cruising for Papatua seamount to put a final dredge there. Preparations for packing up our rocks, data and personal belongings is starting up already, so that we can make a smooth transition for the next science crew to come onboard. Click on the icon above to activate the newly developed Java Applet that follows the ALIA Expedition during its cruise. In here you can get location, water depth, speed and wind direction in near real time as we survey the Samoan seamounts. This discussion embodies the realms of knowledge and understanding between the old and new worlds of Samoa. It emphasizes the genesis of the Samoan islands as inferred by ancient and modern scientists respectively, specifically in the context of human-environment relationships. Please read on to follow this report by International Observer Shaun Williams on the existent similarities between these two cultures. Mapping the Ocean Floor is a complex process, but thanks to modern sonar arrays it has been made relatively easy, and incredibly accurate. Learn how scientists chart the 75% of the earth that is relatively unknown. A CTD is device which is lowered into the water and relays back information about the water it is passing through. They are lowered through a depth range and the data collected is used to create a water profile of that range. Most CTD’s are also equipped with Niskin bottles that can be triggered to collect water samples at different depths. The captain of the ship, Bryon Wilson, is in charge of all aspects of the ship, an responsible for the operation of the vessel. Learn more about this critical person and how/why he came to be captain of a research vessel, and a twin-hulled one at that. Co-Chief Scientist Stan Hart is from Woods Hole Institute of Oceanography. Find out what it is like to be a professor and chief scientists aboard a research cruise. The goal of this dive was to explore the NW breach of Vailulu’u and the recently discovered Nafanua cone in the western portion of the crater. Several instruments and exposure experiments were to be deployed in the crater, and in the spillway of water from the NW breach to a channel north of Nafanua volcano. Read a quick report here and view some exiting underwater video coverage. The goal of this dive was to explore the western summit, the SW basin and Nafanua shield volcano. We were to deploy a current meter, exposure experiments, temperature loggers and MAPRs on the western-most summit. Also we took samples on sites including Lefaleleilagi, the SW upper terrace, on the recently discovered Nafanua shield volcano in the western portion of the crater, and below and at the NW breach. Read a quick report here. If you look closely at the morphology or shape of Ta’ū Island, one may notice a pronounced variation from how it looks in the present day and how it appears on the maps published by the Scottish Geographical Magazine in 1889. From a more circular volcanic cone, this island appears to have changed to a horseshoe shape with its opening facing south. Read here an account on the fascinating explanations on this morphological observation. Report by Shaun Williams. At 8 inches per day a new volcanic hyaloclastite cone has been growing inside the crater of Vailulu'u. During our last DeepFreeze expedition onboard the US Coastguard vessel the Polar Star in May 2001 the crater floor was consistently about 1,000 meters deep, yet over the last 4 years, a 290 m high volcanic cone, named Nafanua, has sprung up filling in the west portion of the crater. Shaun Williams is our Samoan international observer joining the ALIA expedition. 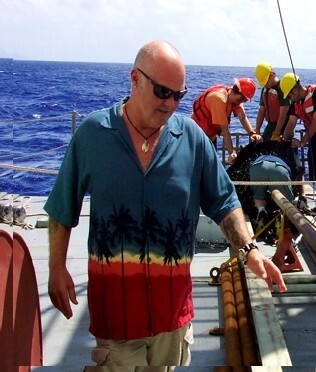 Read his take on the importance of this cruise to the Samoan people, the integration of science in their culture and the importance of teaching about volcanic hazards. The Seamount Catalog is a digital archive for bathymetric seamount maps that can be viewed and downloaded in various formats. Visit this online catalog to find grid and multibeam data files, as well as user-contributed files, from the Samoa Hotspot trail. Tisa's son is cleaning off a grapefruit with a cut-off can (hopefully not, but probably Starkist). Here's the scoop: We, Ryan Delaney, Daniel Staudigel and Blake English, are high school students from High Tech High in San Diego. We were invited to join the ALIA Expedition aboard the R/V Kilo Moana, to report on the daily occurrences on the expedition. These reports are meant to give our perspective on the cruise (sometimes differing from those of our two Fahrt Leiters, i.e. Chief Scientists in German) and they represent a mixed bag of personal impressions from our travels as well as some interesting science tidbits, as we see or learn of them. We're also responsible for much of the content that you see on this site, and in addition to our daily updates, there are certain topics which were too interesting to leave unshared. Please join us as we spend a month at sea in the South Pacific studying oceanography. Note: Just so you know we're roughing it, the water here is 85 degrees Fahrenheit.